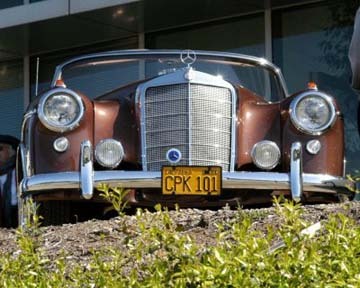 Did you know that some people think Mercedes-Benz created a 1950s model especially for one man named Konrad? I'm not talking about Konrad Adenauer. It is true Adenauer was Chancellor of Germany from 1949-1963, and the Type 300 series Mercedes-Benz limousines are now called "Adenauers." But these ultra high-end vehicles were joined in the Mercedes-Benz range during the 1950s by the 300SL "Gullwing" coupés and roadsters, and by the Type 180, 190, and 220 series "Pontons." It's possible that one of the Pontons was created especially for another Konrad. 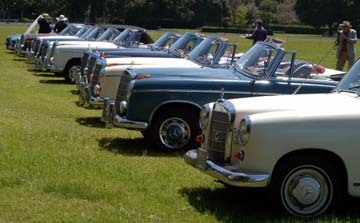 Pontons were the volume end of the Mercedes-Benz offerings, the "E Class" of the 1950s, most often used as family cars, company cars, and even as taxis or ambulances, in contrast to the Gullwings and Adenauers which were "over the top" symbols of status and style. Immediately after their launch in 1953, the Ponton sedans, with their bowler hat round body styling, could be considered conservative, especially as Detroit was beginning to experiment with tailfins and streamlining during the sock hop years of the 1950s. The Ponton's competitive advantage would have to be its innovative engineering, solid build quality, and legendary reliability. But even among Pontons, Mercedes-Benz stylists were able to spin straw into gold. The Ponton 220S cabriolet, which debuted in 1956, was pure Ponton right up to the window sills, but this particular "Sindelfinger" looked much better with her top off! The beauty was more than skin deep. The cabriolets, both the 220S and the later fuel injected 220SE were finished by hand, with only 3,290 units built from 4/56 to 11/60. Many individual flourishes appeared on these cars, with their wrap-around wood interior upholstered with acres of leather, and their low-slung styling. The cars now appear somehow more Rolls-Royce in nature than Mercedes-Benz. 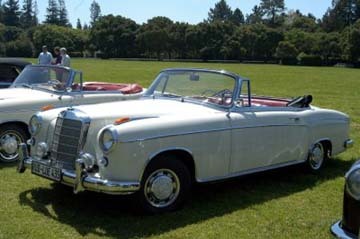 Even though 48 years have now passed since the Ponton cabriolet made its debut, and even though few cabriolets were made, a disproportionate number of these cars were purchased and remain here in California, due to several factors including a benign climate, affluent local customers and an early acceptance of foreign cars. We have only had our 1957 220S cabriolet for a few years, but in that time we have become aware of other cabriolets in a few different ways. We do a lot of driving, and we really try to keep our eyes open, as it's amazing what cars you see if you pay attention. Sometimes a madcap chase will ensue, as we endeavor to get the driver to pull over. Sometimes a simple business card under the windshield wiper has to suffice ("I have a car just like yours..."), and sometimes we are approached ourselves, either in traffic or at a show, "My friend has a car just like yours!" 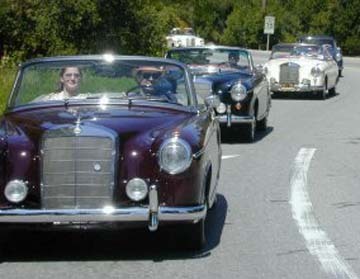 Our collection of cars and owners grew, and pretty soon it seemed we could plan a "Ponton Cabriolet Reunion." At that point, we had collected about ten local cabriolets (and owners). It was time for a party! Easter Saturday (2003) seemed like a good day, mostly because it was coming up soon. It turned out to be risky; the only sunny Saturday in April, and maybe the only day in April when rain did not fall. Note: Next time this party happens (in 2005) it will be in June, on Fathers Day! 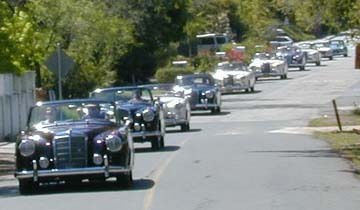 In addition to the local group we compiled, the local MBCA section newsletter edited by Laura Simonds, and the www.mbzponton.org website organized by Jeff Miller, played key roles, locating a few more cabriolets we did not know about. Once the list was complete, we found that a few cars could not come, either because they were in restoration, the owner was out of town, or simply not running at the time. Such is life with 50 year old cars! 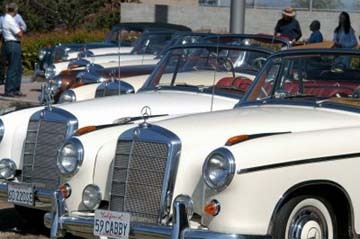 On the day of the event, the cabriolets started to arrive at Autobahn Motors, our local Mercedes-Benz dealer. Marchel Duncan, the service manager at Autobahn, had kindly offered his location and cleared out a special area for us, the landmark display area at the front of the dealership. And what a display! One Ponton cabriolet is a sight to behold with literally hundreds of feet of chrome, the huge grille, and the three pointed star held high and forward with pride. But when there are two together, it's doubly impressive. Now add three and four more, in full view of an eight lane freeway, and WOW! 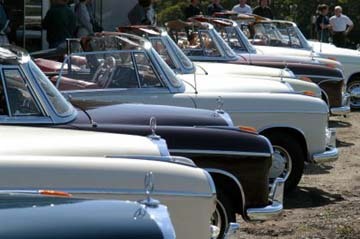 Suffice it to say that we think no one has ever seen this many rare Ponton cabriolets in one place since the factory days. Some of the owners present had never seen another single car besides their own, let alone ten others in one place. Because, as they say in the movie Spinal Tap, this Ponton Cabriolet Reunion "went to eleven." Everyone present was beyond impressed. None more so than the owners of the cars, who eagerly went around comparing notes and paint and chrome and lights and radios and the list goes on. As cars that are hand-fitted and finished, some variation was possible and we had a lovely variety of cars to look at. After a few hours of standing around comparing, we departed Autobahn Motors on a cross town trip, just a few miles on city streets and a country road, but what a number of smiles were provoked from so many people we passed. Again, a single cabriolet brings looks and smiles without even trying, but when the viewer sees the second cabriolet, the smile turns to a laugh, the third car brings a wave, and finally a certain form of paralysis sets in. We had an impromptu parade that stopped traffic all along our route to lunch. We went to a local country club that had space on the polo field for the cars to park, because grass usually yields the best automotive photo opportunities. The cars were a simple show, but just parked in a line they were stunning to all viewers present. The assembly was especially stunning to another guy named Konrad. When we first acquired our Ponton cabriolet and drove her up the driveway, a family member said, "That's just like my friend Konrad Schoebel's car!" In disbelief, we drove to Konrad's home, five miles away, and he became the first on our list, the 'Hoheit' of our growing group of Ponton friends. 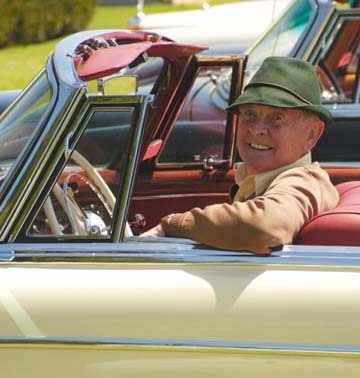 Konrad purchased his car new in 1958, and has driven it as a daily driver ever since, with one break in the 1980s when it underwent a significant restoration. Today the car is as beautiful as the day it rolled out of the Sindelfingen factory, and Konrad is a familiar sight in town, rolling about in sporty elegance during the summer months with the top town and a German alpine hat. Konrad is not bashful about his love of Pontons: "After 30 years, my friends asked me why I still drive the same old car. The reason is because I like it!" The long relationship, now spanning 45 years, has become legendary, and last year Konrad appeared on a local TV news show with his car. We began to wonder if Mercedes-Benz had created the Ponton cabriolet especially for Konrad. Konrad is another Mercedes-Benz lover who has become a dear friend, and on the day of the reunion, he arrived early, and as the field grew, even he was thrilled. "I don't know how you did this", he said through a smile, beaming as he suddenly realized the 'club of one' he has been president of for 45 years actually has other members. The other members were just as glad to learn that our Pontons have a Konrad, too.